“Proprietors deed land for new capital,” Histories of the National Mall, accessed April 23, 2019, http://mallhistory.org/items/show/198. In July 1790, when Congress approved the establishment of a federal capital on the Potomac River, the area they chose was already owned by people who lived and farmed there. President George Washington and other government officials negotiated with these proprietors to convince them to sell or donate the land to the United States. In March 1791 fifteen proprietors signed an agreement that sold half of their property to the government, while they kept the rights to the other half, which allowed the city to develop while residents kept their homes. 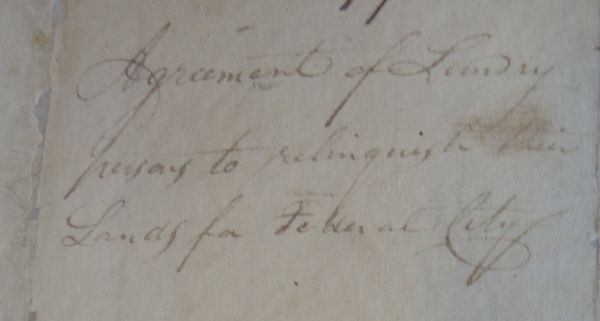 Formal deeds of transfer were registered in December 1791.